When a massive weeping willow tree fell in the woods near master crafter Mike Jarvi’s studio, he studied it for many weeks before making a first cut. Then he got out the chain saw. The tree had stood astride an intermittent stream for nearly 70 years before falling in a storm. As Jarvi hewed into an especially thick area of the trunk, its remarkable grain and age rings were revealed. The fast-growing willow had recorded both floods and ebbs of water in its rings—some remarkably wide, indicating flood years when the tree grew in great leaps, others quite slim, marking years of drought for the water-loving species. Willow desk and chair by Mike Jarvi. 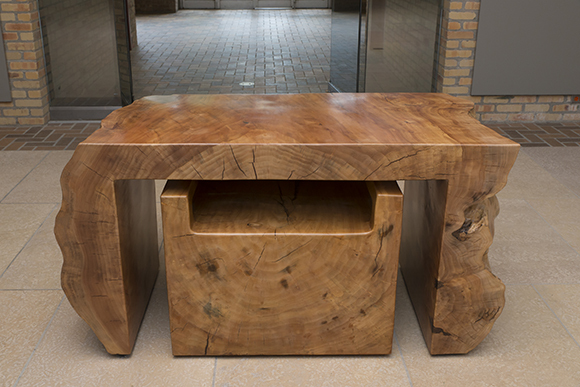 The front view of this massive desk, created from a single willow trunk. Jarvi cut one massive section from the trunk, envisioning a desk, then cut into that piece for a matching chair that fits neatly into the desk “slot.” Both pieces were hoisted into his shop’s loft to dry…for four years. The chair slab weighed in at 230 pounds when it arrived; four years later, is was down to 130 pounds, having lost 100 pounds of moisture. 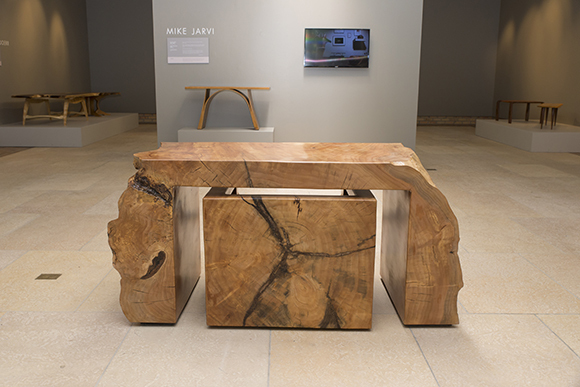 On view in The Hidden Art of Trees as desk and chair, the willow and its tree rings—and their recorded history—are visible now for all to see. The Hidden Art of Trees is on view at the Regenstein Center through August 21, 2016. Admission is free; parking fees apply for nonmembers. Art in its purest form. Such a pleasure to see. Thank ou.